I’ll avoid spoilers for both parts, but let’s face it, you’re not buying Part I without Part II, so I might as well review them together. Christopher Benjamin and Trevor Baxter are beloved in EU fandom circles for reviving those erstwhile Victorian chaps, Jago & Litefoot, by far the best thing to come out of the classic Who story Talons of Weng-Chiang. They’re a joy to listen to, even when it’s just Jago losing himself in a deluge of alliteration, or Professor Litefoot waxing philosophical. I’ve heard nothing but raves about their own series, but I’ve sternly told myself I can’t chase down every spinoff until I’ve caught up on more classic Doctors’ audio adventures. Therefore, I’m selfishly pleased whenever they sneak into one of the ranges I’m currently following. They’re a two-person vaudeville act, so even when it comes to single-narrator Short Trips— or even when the good professor takes a long trip to Greece— they can’t stick to a solo outing. Instead, they take turns narrating their parallel adventures, which sound a little like a classic tale of the Fair Folk transposed into an SF key. A bewildering young man waltzes in and out of the fringes of their twin tales, serving as tour guide to the terrors they’re facing. The menaces disrupting Jago’s theatre and Litefoot’s sabbatical are eerie but two-dimensional, and the plot is simple, but both plot and peril are really beside the point. The joy of these audios lies in the humourous, innocent, and sometimes poignant exchanges between our Victorian paranormal experts and an old friend wearing an unfamiliar face. Both Baxter and Benjamin capture his mannerisms convincingly, even lovingly, such that it’s easy to hear David Tennant’s voice and great acting coming through. I wonder which episodes they watched to research their impressions? And of course, since this is Big Finish, there’s time for a few clever twists and a fun fanservice surprise. Here’s the trailer for Part II; it doesn’t spoil anything for Part I. Whereas the Part I trailer is slightly spoiler-ish in that it gives away one of the more magical moments in the story. Part I eases into the adventure with a lengthy prologue to set the stage and introduce our two principals to new Who listeners who may not have encountered them before. Jago’s description of a madcap chase scene in Part II does go on a bit, lyrical language notwithstanding. Padding aside, it’s an entertaining romp, and I found myself grinning several times while listening. As an old Whovian who hasn’t seen enough of the new show, I’m sure I missed some of the nuances, but I was still moved. 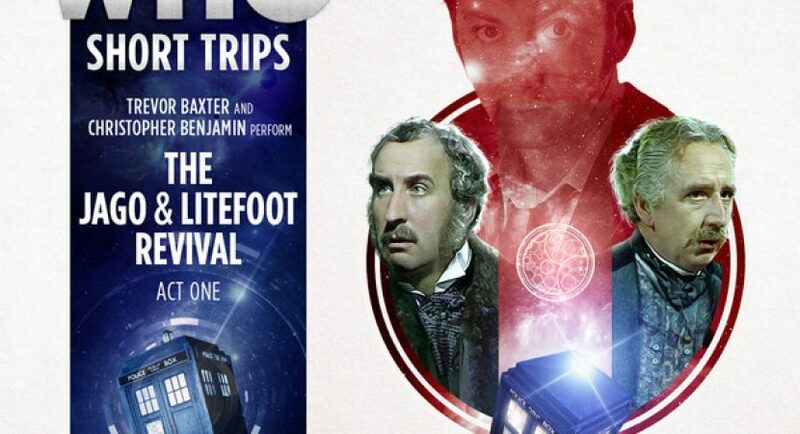 I think fans of new Who will enjoy these bite-sized Short Trips just as much as classic fans, even if you’re not familiar with Jago & Litefoot. (Think Paternoster gang, except that Drax is a barmaid named Ellie, and the crime-fighting duo is a pair of eccentric Victorian gents who are no more romantically involved than Sherlock & Watson *cough*). Short Trips began as 15-minute bite-sized Who, but they’ve expanded to half an hour and upped their production quality over the years. At this point they’ve turned into what Companion Chronicles started out as: the world of Doctor Who and the Doctor himself seen through the eyes of the remarkable yet ordinary people who travel with him. This two-hander takes the opportunity to blend old and new in a delightful way. I’m seldom fooled, but I was thoroughly taken in by the red herring of the beastie exterminator and his astounding gadgets. He sounded enough like Ten that I was baffled when he expired. So, while I thought Litefoot’s impression of the young Doctor was rather better, I confess I didn’t pick up the fact that Jago was imitating Eleven’s puppydog exuberance instead of Ten’s slightly more serious élan until Part II. It’s very obvious unless you’re an old fuddy-duddy like me who hasn’t watched much of Smith’s run yet (I’ve seen Ace wearing a fez about as often as he does, and for that matter I remember it falling on Ten’s head in the 50th, but I forgot it had left its usual owner). Also, fun twist having the director pop out of her chair and into a sound booth for the epilogue. Litefoot’s gentle homage to the Doctor excerpted in the Part I trailer quite touched me, as well as Ten’s understated farewell. I love the fact that Ten’s resolve to visit old friends during his regeneration extended to Professor Litefoot, and hope BF will use that excuse for a few more crossover audios, although I suppose they can’t indulge in too much of that kind of fanservice.